A lot of happiness and be blessed… that´s the inspiration of this work. Originally composed at Óbidos it has the spirit of encounters, the spirit of Valentine´s day. 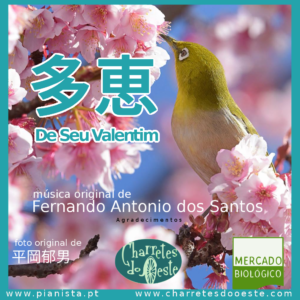 ” De Seu Valentim ” translates to ” from your Valentine “. it is the phrase that signed the letter in that beautiful legend. Celebrated by Catholic Church, for nanny years , is now a truly universal celebration. The celebration of Love, between man and woman. The promises of life.